No. Real cellular services, as measured by the BEA, only goes up at the rate of new subscribers (see chart in my paper). 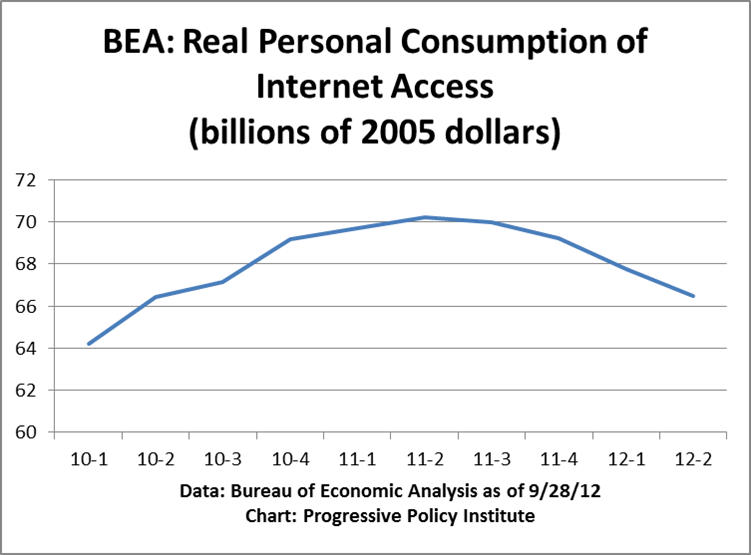 So when you add up BEA’s numbers for mobile, wired, and internet access, you only get a very slow growth rate. Where’s the beef? Looking at Real Consumption data (NIPA, Table 2.4.6U monthly) It’s even worse when we add in the other categories Michael frets about. Yes consumption of Cable and satellite television and radio services, and Internet access have dropped a very small amount, but also the land line telephone usage has fallen. So just how much have these services dropped from June 2011 to August 2012 ? $8.95 Billion, but how about computer hardware including tablets, computer software and mobile cell services ? In that same time frame they are up $34.2 Billion. Sounds like mobile services up $5.3 made up for the loss in internet & landline, and tablets even more so. Lastly, the mobile subscribes line is wrong in Figure 2. Too much of that is simple replacment of landline phones. If you adjusted the subscriber line (blue line) by the loss in landlines (NIPA table Table 2.4.6U again) you would have a dramatically different picture.